It won’t be long until colleagues across the country are swapping Secret Santa presents, and perhaps you are already cursing the name you picked out of the hat. The time has come to keep an eye on your assigned giftee, slyly coaxing out their innermost passions during kitchen small talk. Or just try to figure out whether they prefer white or red. Perhaps they spend their weekends painting delicate watercolours, or running around a football pitch. Maybe you know them well enough to get them something decidedly NSFW from Ann Summers. 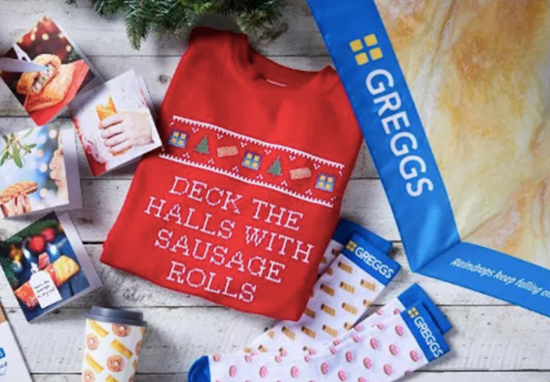 This year, Greggs are selling a range of pastry themed stocking fillers, whether you’re partial to a sausage roll or a doughnut. Best of all, proceeds will go straight to the Greggs Foundation, an organisation which champions community-based charities throughout the UK. Catered for a number of budgets, you can grab a classic pair of socks with either a sausage roll or doughnut print for £4.00 per pair. You can get a handy reusable cup for £3, and – for the punk pasty liker in your life – a set of five Greggs pin badges for £6.50. And – if like me you still need to send your Christmas cards – you can purchase a packet of eight Greggs cards for £4.00. 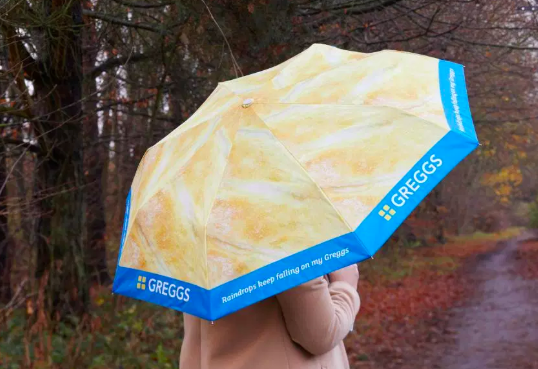 For a little extra, you can keep dry with a Greggs brolly (£10.00), or keep your phone looking tasty with a Greggs’ phone cover (also £10.00). Both are – of course – festooned with the image of Greggs’ iconic, golden sausage roll. 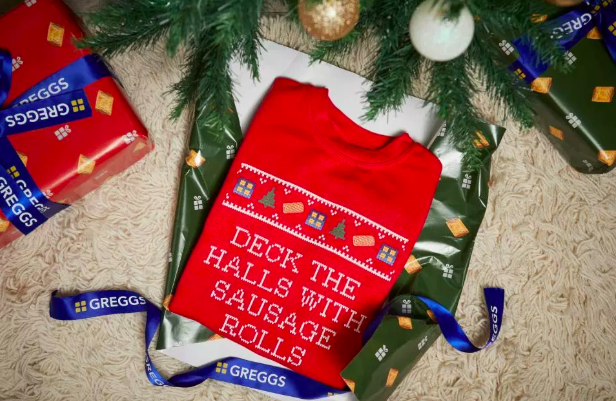 My personal favourite has to be the Greggs’ Christmas jumper (£18.00), adorned with the solid advice ‘Deck the halls with sausage rolls’. This is more than ideal for keeping cosy and festive throughout the German market season. For serious Greggs enthusiasts, there is the High Roller gift card, which can be topped up with a minimum fund of £50. Enough to keep a special someone richly stocked in afternoon iced fingers for some time. Sadly, these fun gifts are available in just five branches of the beloved pasty proprietors: London’s Stratford Shopping Centre, Birmingham High Street, Manchester’s Parker Street (Get in! ), Newcastle’s Grainger Street and Glasgow’s Buchanan Galleries Shopping Centre. These branches will also be offering an extremely helpful free gift wrapping service, where gifts will be wrapped up carefully in a festive bake design. Perfect for those of us who struggle to find the end of the Sellotape. Our free gift-wrapping service means weary shoppers can take a break while our elves wrap their presents, and they can even pick up some gifts for the Greggs fan in their life (or themselves) with our limited edition range. Products will go on sale from Tuesday, December 11 up until Thursday December 13, with gift wrapping available between the hours of 4pm and 8pm.